You know the story of the Bible, but do you know what it means? This kids? edition of Believe teaches you the core beliefs, practices, and virtues of Jesus-followers so that you can understand how to live out God's story in your own life today. As you walk through the three big categories?beliefs, practices, and virtues?you'll begin a journey that will take you closer to the heart of Jesus and deeper into the words of Scripture. You'll learn what the Bible has to say about everything from the nature of God and the identity of Jesus, to prayer, worship, and the fruit of the Spirit. Each big category is divided into ten topics to give you an up-close look at the important things God wants you to know. From bestselling author and pastor, Randy Frazee, the Believe: Kids? Edition will take you on a step-by-step tour through the Bible and show you how to think, act, and be more like Jesus. 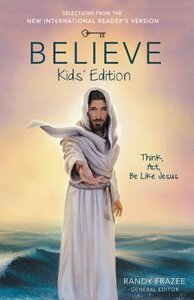 About "NIRV Believe Kids' Edition (Believe (Zondervan) Series)"
Grounded in carefully selected scripture, Believe is a church-wide spiritual growth experience for all ages, taking churches and individuals on a journey to think, act, and be more like Jesus. This church-wide discipleship program takes you on a journey to become more like Jesus in your beliefs, actions, and character. This 30-week experience introduces your church to the 10 core beliefs of the Christian faith, the 10 core practices of a Jesus-follower, and the 10 core virtues that characterize someone who is growing more like Jesus. The accompanying age-appropriate curricula, as well as a rich assortment of printed and digital tools, make this a powerful church-wide discipleship program. Like The Story, this affordable, customizable, and easy-to-use experience starts with the Bible. The Believe Church Resource Kit includes all of the materials needed for 30 weeks of study with children, students and adults. Each kit includes the five core books (NIV Believe; Think, Act, Be Like Jesus; Believe: Student Edition; Believe: Kids' Edition; Believe Storybook), curriculum for all ages (Adult DVD-ROM and Study Guide, Student DVD-ROM, Children's DVD-ROM), Implementation Guide, and a password to access the Believe Online Resource Library to download a multitude of resources, including sermon outlines, preparation guides, and much more.